Note: You can enter this giveaway one (1) time per e-mail address per day. Deadline is 11:59PM ET 11.22.18. Come right in and sit right down. 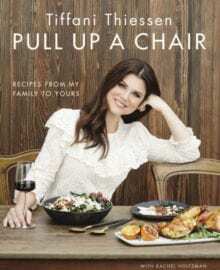 Tiffani Thiessen, host of Cooking Channel’s Dinner at Tiffani’s, is sharing 125 recipes in her debut cookbook. Invite over a few friends and share Stuffed French Toast for brunch, or serve Short Rib Enchiladas for a game day party. The recipes and tips will help you pull off the impossible without going crazy in the process, whether that’s feeding the pickiest of eaters, or serving a large crowd. We’ve shared some of our favorite recipes in the LC Staff Favorite Recipe Slideshow. We bet they’ll become some of your favorite go-tos as well. NO PURCHASE NECESSARY TO ENTER OR WIN. Void where prohibited by law. Open to legal residents of the 50 U.S., D.C. and Canada (excluding Quebec) who are at least eighteen years old at the time of entry and have internet access. Begins on 11.1.18 at 12:00 a.m. ET and ends on 11.22.18 at 11:59 p.m. ET. To enter this giveaway, submit your full name and email address on this form. Odds of winning this giveaway depend on the total number of eligible entries received. Only one (1) entry per email address per day. Sponsored by Leite’s Culinaria, Inc. For more information, visit our Official Rules. For a list of winners, check out our Very Happy Winners page. Be sure to add giveaways@leitesculinaria.com to ensure notification if you are the winner.